Phil and Anne from Alphamarine Photography, based in Manchester, will be doing a presentation to the Club on Tuesday July 2nd, starting at 8.15pm at the Blue Bell Cottingham. The presentation will cover various aspects of digital underwater photography, and there will be the opportunity to ask questions and advice on this topic. They are online photographic equipment retailers so there will be the opportunity to seek advice and potentially purchase items from them however they will not be pushing sales. It will last about an hour. The presentation is open to all club and non club members, so feel free to invite anyone along who may be interested. The cost to attend will be £2 per person and this includes a raffle ticket. Please try and support the club by attending, the better the attendance, the more funds we can raise for the Club. 4 members of Hull BSAC, Tony (DO), Sarah, Peter & Niloy were up early Saturday morning to catch the tide. An easy beach launch from Hornsea with their excellent tractor man followed by a pleasing trip over gentle chop. Plan: to dive UC39, a German U boat sank in 1917 lying about 8 miles off Hornsea resting in 30m of water. Arrived on site to find it already buoyed. Subs can be a little difficult to ping on the echo sounder due to their long thin profile. You must approach from the side of the sub to maximise your chances of locating it. First pair (Sarah & Peter) kitted up, buddy checks done and entered the water. 30 mins later surfaced with smiles on their faces reporting poor vis but a good dive. Second pair (Tony & Niloy) kitted up, buddy checks, in we went and down the line. A little ambient light made use of torches essential. We circumnavigated the sub, covered with soft corals and surrounded by juvenile cod plus a few large adults and the occasional lobster. Apres dive. Pork pies, cheese & onion rolls, olives, cherry tomatoes & salad washed down with fizzy drink. 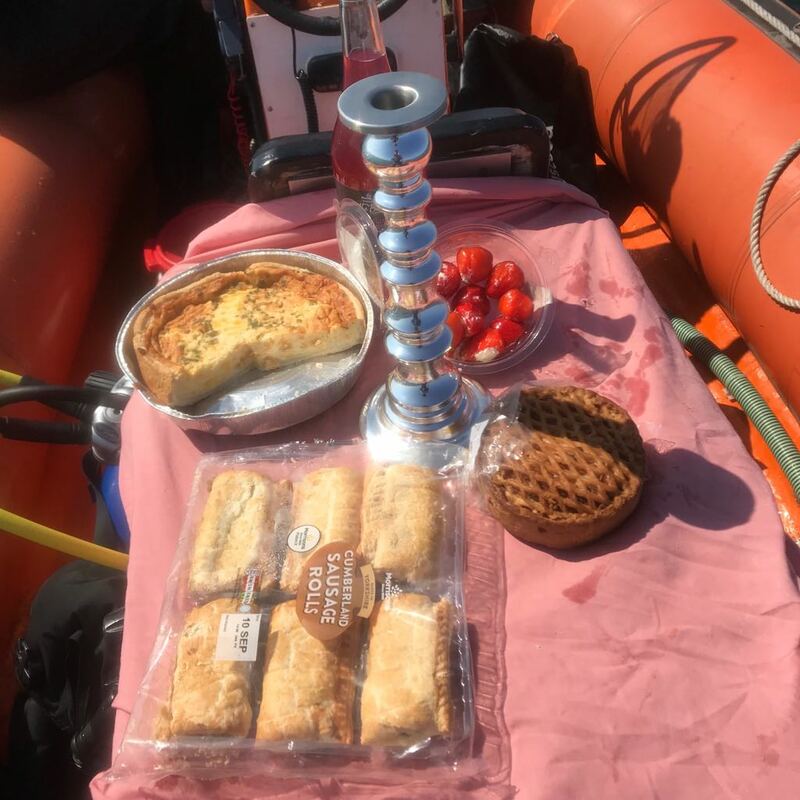 Postscript - not to be outdone, Boat Officer Dennis took up the apres dive challenge and brought a new level of sophistication to the club boat by adding a candlestick. Think you're missing something though Den! Thanks to Robert Danby for his report on a recent club trip to Eyemouth. Eyemouth has a great mix of scenic and wreck dives and it's close enough to manage in a weekend trip. Read the full report here or check out the photos in our Photo Gallery. 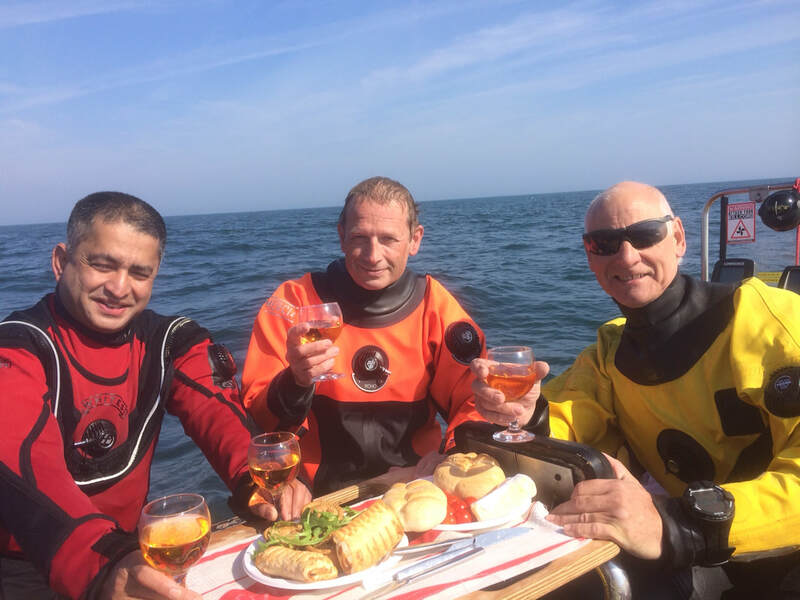 The 2016 season is in full swing and club members have been busy diving in warm water and cold. Check out our video gallery for two new videos of the MV Canada, a popular dive site just 3 miles off Withernsea. Great viz on both clips - shows just how great our local diving can be. The first video was taken by James Higson, son of club member Bob Higson - you can't miss Bob in the video, he's the day-glo yellow one! The second is from Craig Plant - watch out for the man vs crab sequence. If warm water and big toothy fish are more your thing, visit our photo gallery for Red Sea shark shots from Vincent Hong's recent trip. In July 2016, the pool we use for training at South Hunsley School is due to close. The pool has served the community, school pupils, swimming club and thousands of swimmers for the past 50 years and provides facilities for swimming lessons and galas for Primary School and South Hunsley pupils, base for the 200 member South Hunsley Swimming Club, Elderly and Disabled swimmers, Master Swimmers, Triathletes, Aqua Fit, Lifesaving and Water Safety Courses, Water Polo Club, Out of School/ Holiday Clubs, Pool Parties for local community children, Public and Leisure swimming sessions and of course, training for scuba divers. Effective training for divers requires a deep pool - you simply can't practice a lot of the skills needed to dive safely (ascents, buoyancy control, rescue technique) in a shallow pool. If the pool at South Hunsley School closes, we will struggle to find suitable alternative facilities locally. We're back in the pool for training, trying out kit or just for a swim. The club has exclusive use of the pool at South Hunsley School from 7-8pm on Tuesdays until the end of May. You can find directions here. We offer a wide range of training for beginners and more experienced divers, so if you'd like to move to the next level, now's the time to start. Talk to the club instructors or see our training page for more details. We also offer try dives for people who'd like to have a go with scuba gear and find out what it's all about. January is a great time to start training if you're looking to get in the sea in the UK or overseas this summer. Try dives are available for £10 and the cost is deducted from the membership fee for try divers who join the club in 2016. We recently received an enquiry via our website from the great grandson of a crew member (possibly Captain) of the MV Victoria, which sank in the Humber in 1940, asking if we had any information about the ship and its location. Unfortunately, I have been unable to reply to the enquiry because the email address given doesn't seem to work. I'm posting here and on Facebook in the hope that it finds the person who made the enquiry. I found quite a bit of information about the MV/HMS Princess Victoria, including personal accounts from other descendants of crew members, on wrecksite.eu - a fantastic source of information about historic wrecks. Princess Victoria was built in 1939 as the first stern loading car ferry for the London Midland & Scottish Railway Co. and was used on the Stranraer to Larne route. Engines by Wm Denny & Sulzer diesels, 21 knots (Sulzer constructed the port engine in Winterthur, whilst Denny constructed the starboard in Dumbarton). She was taken over by the Admiralty as an auxiliary minelayer. On the 19th May 1940 she struck a mine off the entrance to the Humber and sank quickly. Captain J.B.E. Hall, three officers and 32 ratings were killed. See HMS Princess Victoria on wrecksite.eu for further information.